Happiness In A Cup – COFFEE! Have you had your stimu-latte today? Oh the famous yawn, a silent scream for coffee! Not only is coffee the second most traded commodity after oil, it is the world’s most widely consumed psychoactive drug, yet thankfully it is safe in small doses. If you are a science nerd, Trimethylxanthine is the proper name for caffeine. It is a bitter tasting crystalline powder closely related (in its effects) to opioid antagonist drugs like heroin and cocaine. Coffee acts on the adenosine receptors found in the brain and prevents the onset of drowsiness while stimulating our central nervous system. 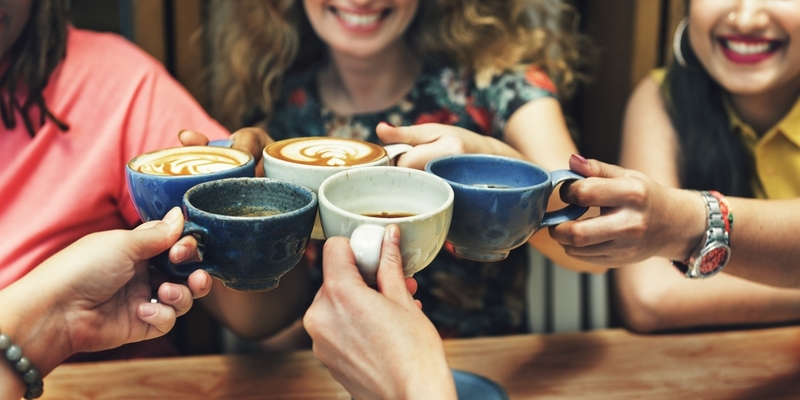 Studies have suggested 90% of people consume caffeine, so even if coffee isn’t for you, there is still a very high chance that caffeine has found its way into your diet. Caffeine can be found in chocolate, fizzy and energy drinks, weight loss and pain relief pills, decaf coffee, ice cream, fancy water and more! Regular use does cause mild physical dependence however caffeine doesn’t threaten our physical, social or economic health in the way in which other harmful and addictive drugs do. 1. Why are you drinking it? 2. Why are you avoiding it? Perhaps you are uniquely sensitive or have an intolerance? Or the amount of caffeine you consume affects your body in a negative way? Perhaps you are dependant? Or maybe you love the taste? Perhaps you enjoy the social culture and connection it offers? Maybe it sharpens your mind and improves your physical performance? When it comes to coffee, the best is obviously how you like it, and the second best is in its truest form. So, if you don’t enjoy munching on coffee beans, then an espresso coffee is the purest coffee experience you can get. While they’re not for everyone, it can be a truly singular drinking experience when you find a good brew. • Embrace and enjoy the pleasant ritual and social culture that coffee offers. • Be mindful of the quality and quantity. Coffee is one of the most chemically treated crops and this is why it’s important to choose organic where possible. • If you consume caffeine for energy reasons yet feel coffee dependant and want your energy to come from another source, get moving moving moving!! Movement is fantastic for giving you those feel good hormones along with more energy to burn! Another awesome way to get more energy is taking a closer look at your diet – this is where our Clinical Nutritionist Heather can help!